It’s common for humans to encounter baby birds in the spring and summer. Depending on the species, baby birds can spend days to weeks in the nest, where they are cared for by their parents. As the babies develop, they grow in feathers and get ready for the next stage of development – fledging. As baby birds take their first flights, many species stay close to the original nest, where their parents continue to care for them. 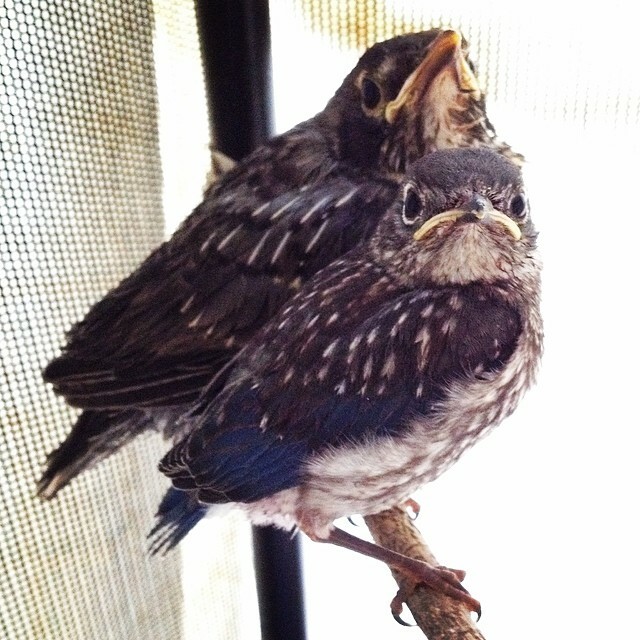 Please give baby birds the best possible chance for survival and leave them in the wild where they belong! Is the bird injured (bleeding, broken bones, puncture wounds, been in a cat's mouth, open wounds, etc.)? 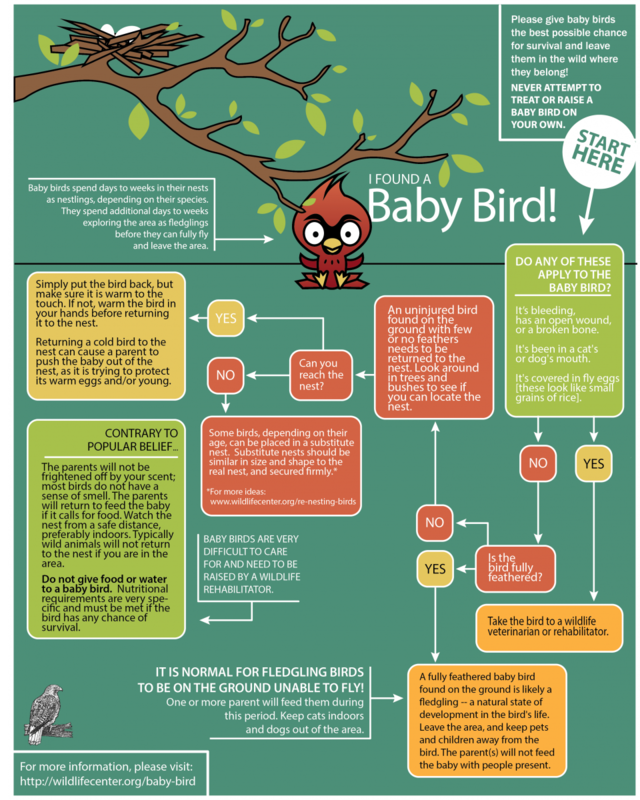 If YES, any fully feathered baby bird found on the ground, seemingly unable to fly, is likely just fledging - a natural state of development in the bird's life. 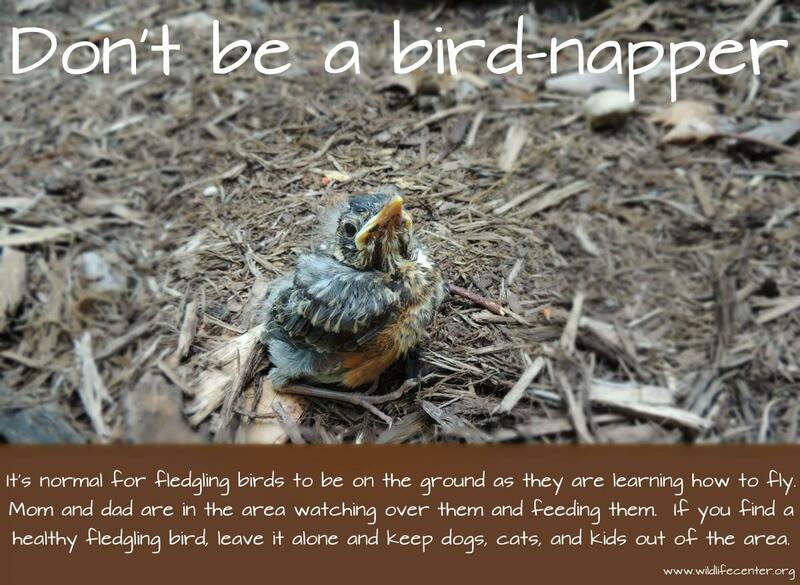 It is normal for fledgling birds to be on the ground! Birds need several days -- up to four weeks, depending on their species -- to learn how to fly and forage for food. One or more parent will continue to feed them during this period. Leave the area, and do your best to keep pets and children away from the bird. The parent(s) will not feed the youngster while people are around. If NO, attempt to find the nest. An uninjured bird found on the ground with few or no feathers needs to be returned to the nest. Look in nearby trees and bushes to see if you can locate the nest. Correct species identification of the nestling or of the parents will help locate the nest (i.e., bluebirds are box or cavity nesters, morning doves build basket nests on horizontal branches or in a tree fork). 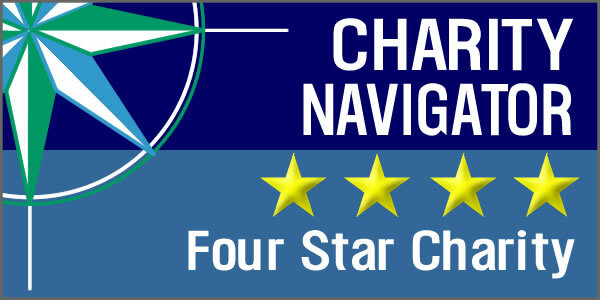 Cornell's All About Birds website has excellent information on nest type and placement. Can you find/reach the nest? If YES, simply put the bird back. However, first make sure the bird is warm to the touch. If the baby is not, you can simply warm the bird in your hands before returning it to the nest. Returning a young, cold bird to the nest will sometimes encourage the parent to push the baby out of the nest, as the parent is trying to remove a cold object to protect other warm young and/or eggs. If NO, you can't locate the nest, are unable to reach it [even with a ladder], or if the original nest is destroyed: many young birds [depending on their age] can be placed in a substitute nest. As long as the bird is at least partially feathered, construct a substitute nest of a similar size and shape and securely attach it as close as possible to the original nest site, or where the nestling was found. Read more here for suggestions on constructing a substitute nest. Contrary to popular belief, the parents will not be frightened off by your "scent" and will return to feed the baby if it calls for food. If you want to be sure the parent(s) will continue to feed the baby, watch the nest from a safe distance, preferably indoors. Many wild birds will not return to the nest if you are visible and/or in the area. If a parent does not visit the new nest for more than half a day, contact a permitted songbird rehabilitator for advice. Please give baby birds the best possible chance for survival and leave them in the wild where they belong! Never attempt to treat or raise a baby bird on your own. Despite your best efforts, most hand-raised birds will die. The best baby bird rehabilitation is prevention. Educate your friends, family, neighbors, and yourselves about the fledging process. Know where nesting sites are located, and keep cats and dogs indoors around the time you think the birds will fledge to avoid predation. Ask neighbors to take responsibility for their pets as well. NOTE: Raising a wild animal in captivity is illegal unless you have both state and federal permits. For information on how you can become a permitted wildlife rehabilitator, visit our wildlife rehabilitation training page, and contact the Virginia Department of Game and Inland Fisheries [PDF] or your state's wildlife agency.